Madhav Rajan joined the Chicago Booth faculty on July 1, 2017, as Dean and George Pratt Shultz Professor of Accounting. Before joining Booth, Rajan spent 16 years on the faculty of the Stanford University Graduate School of Business where he was the Robert K. Jaedicke Professor of Accounting, with a courtesy appointment in the Law School. He served as senior associate dean for academic affairs from 2010-2016, overseeing the school’s MBA program. From 2002-2010, he was area coordinator for the accounting faculty group. Previously, he served on the faculty at the Wharton School of the University of Pennsylvania, from 1990-2001. While at Stanford, Rajan received the Robert T. Davis Award for Lifetime Achievement and Service (2017), and the Notable Contribution to Management Accounting Literature Award (2004). He also was the recipient of the David W. Hauck Award for Outstanding Teaching at Wharton (2000) and the Alexander Henderson Award for Excellence in Economic Theory (1990). 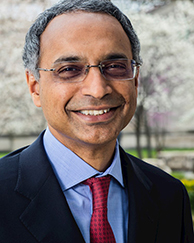 As Dean of Booth, Rajan has focused on deepening the school’s ties to the University of Chicago, attracting and retaining the best faculty, completing the new Hong Kong campus, and sustaining positive momentum in the University campaign during its final year. His primary area of research interest is the economics-based analysis of management accounting issues, especially as they relate to the choice of internal control and performance systems in firms. He has carried out analytical, empirical, and field-based research on the role of information in incentive contracting, the value of nonfinancial and subjective performance measures, and the structural properties and usefulness of common financial ratios. Rajan has served as editor of The Accounting Review, as well as Associate Editor for both the Accounting and Operations areas for Management Science. He has twice been a plenary speaker at the AAA Management Accounting Conference. He is coauthor of Cost Accounting: A Managerial Emphasis, whose 16th edition was published by Pearson Prentice Hall in January 2017. He is also coauthor of Managerial Accounting, whose first edition was published by Pearson in January 2013. He is a Director of iShares, Inc. and a Trustee of the iShares Trust. Rajan received his Bachelor’s degree in Commerce from the University of Madras, India, and an MS in Accounting, an MS in Industrial Administration, and a PhD in Accounting from Carnegie Mellon University.